The Ankle Stretch Pose in Yin Yoga is an intense ankle opener that also requires a single point of focus and balance. This pose is not for the faint of heart, as it can be quite difficult for some. This pose is not very intuitive and not often practiced in the yoga classroom. However, it's benefits are substantial and if you are a runner, hiker or long distance walker, this pose, along with the Toe Squat Pose will keep your feet and ankles healthy! 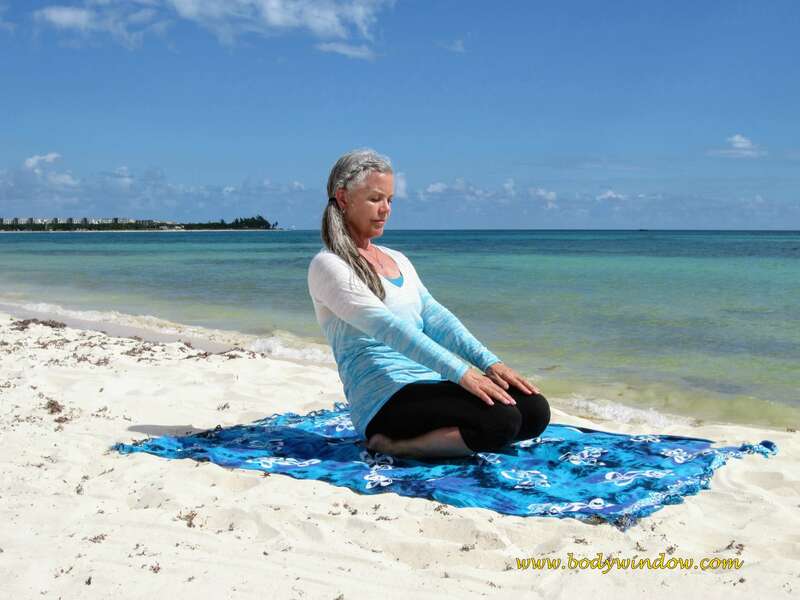 The meditative practice of Yin Yoga requires more time and patience than most forms of yoga. The key to a successful practice is what I call "Wait while you weight." This is because the essential components of the practice is holding the pose for 3-5 minutes, usually, and utilizing your body weight to provide pressure to slowly open and juice your deeper tissues of the joints, ligaments, tendons and fascia. Please see my article on the tenants of Yin Yoga if you are unfamiliar with this type of inward-looking practice. Fortunately, it is gaining in popularity! 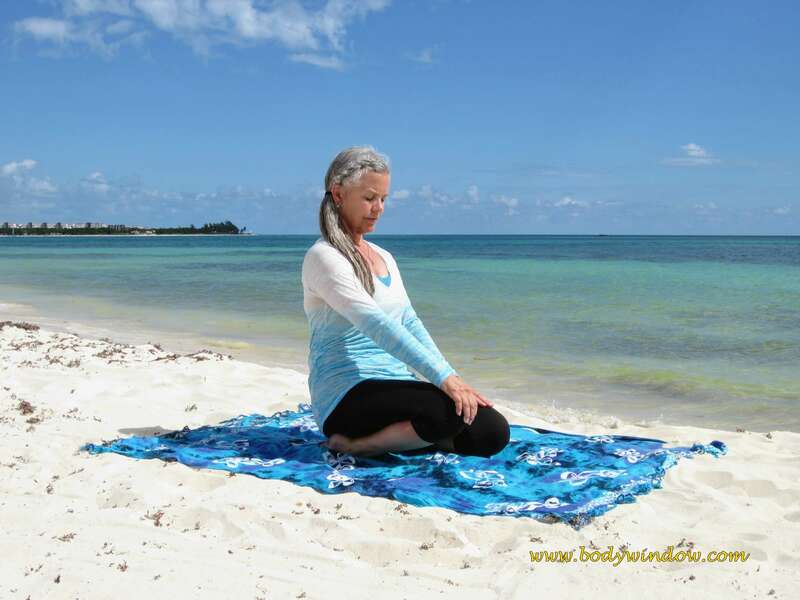 Begin by coming to a kneeling position on the floor. Then, with the tops of your feet on the ground, simply lean back and sit on your feet. The dorsal surface, or the tops of your feet are firmly placed on the ground, as shown in the photo, below. Before going into the pose with both legs, I like to do one side at a time first, to test my ankles and how they feel. Often one ankle may be more closed than the other, so if you start off doing the full pose right away, you will not be as aware of any issues. Keeping your upper body straight, your chest high and your torso at a 90-degree angle from your thighs, place your left hand on your left knee. Slowly lean back onto the right hip as you guide your left knee off the ground with your left hand. See the photo below. You should feel a nice pull on the front of your left foot at the ankle. Assess any pain here. If you have more than a mild pain in your left ankle, this pose is not for you. If your left ankle checks out OK, with deep, conscious breathing, hold the pose for a minute or two. This is another quite edgy pose, so don't hold the pose too long if the stretch is more than a medium to mild sensation of pain and strain. You can assess this by your level of breathing. If it is slow and even, and you can move into stillness, continue to hold the stretch. When you are ready, release your left knee and come back to neutral. If you need to rise to your knees, go ahead for a few breaths. When you are ready, assess your right ankle in the same fashion, as shown, below. You are leaning back onto your left hip as you raise your right knee with your right hand. Hold the right ankle stretch for as long as you did your left. Continue your breath/stillness/interior work. When you are ready, release the right side and go back to neutral once again. Rise to your knees to release your right ankle if needed for a few breaths. When you are ready, you are now going to do both ankles at the same time, as shown in the next photo. Lean back toward your ankles, again keeping your torso active, lifted and at a 90-degree angle as shown above. I am unable to keep both hands holding my knees with the full pose, so I just rest them on my knees instead. In addition to the ankle opening feature, this pose is a balance pose. 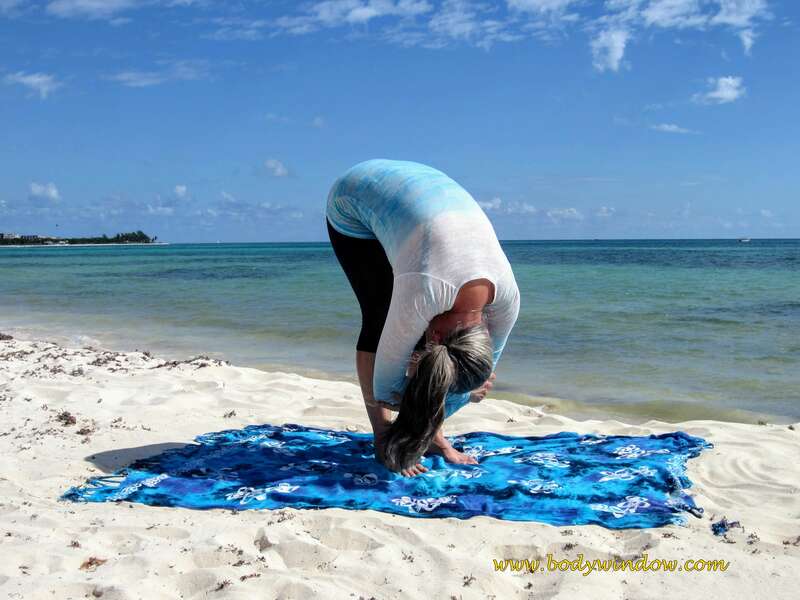 If you find yourself wobbling forward and back in an attempt to hold the pose, you can always reach back with your hands behind you to touch the ground. This is an easy modification of the pose. If you find you are close to the balance, find a single point on the ground in front of you to gaze upon. This will still your eyes and mind and you may then find the balance aspect. This single point of focus is called your drishti point in yoga and when you use it you strengthen your crown chakra. Opening this 7th chakra through the concentration required is the essence of meditation. Yes, you are meditating whenever you focus on your drishiti point, your breath, stillness and your interior world! This is why Yin Yoga is so healing. Hold the full pose for 2-3 minutes, or longer if you find the sublime place where time ceases. Otherwise, come out of the pose by merely lowering your knees back to the ground, when the pose becomes too intense. The alternating poses in this sequence creates a nice opening of your feet, ankles and toes for strengthening and grounding energy. It is the 1st Chakra that is opened when you perform this sequence. I hope that you enjoy this sequence of 16-24 minutes, to find your grounding energy stimulated and your balance energy strengthened! It is a wonderful sequence if you experience any type of foot pain, like plantar fasciitis. May you find your path to complete wholeness and health when you are mindful of your body and its energy systems when you do the Ankle Stretch Pose. May you find perfect health of your ankles, feet and toes! Namaste! Want a handy reference, over 125 pages of all 36 of my Yin Yoga poses in a complete eBook? 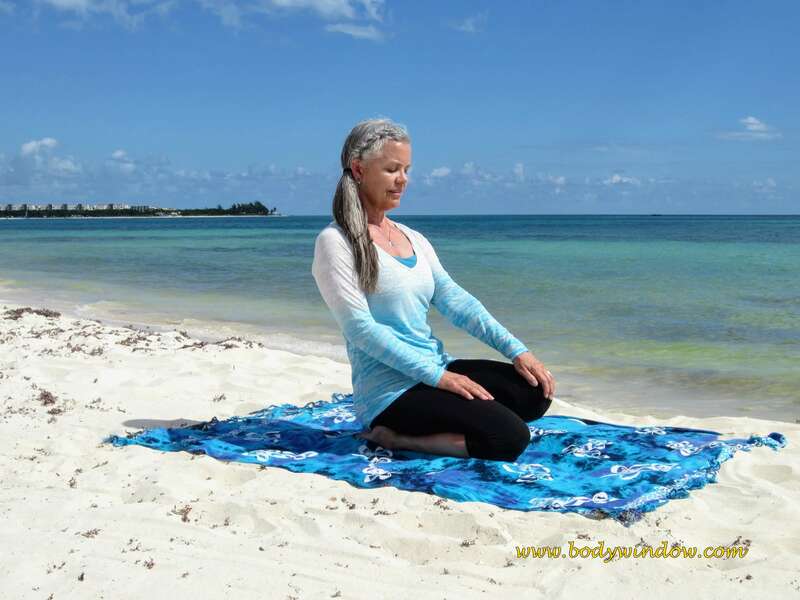 If you wish to stay healthy, or have a targeted area for healing, there is nothing like "The Quiet Practice of Yin Yoga" to heal your body, mind and soul! Click here to learn more! Don't worry - I use PayPal, but it allows payment with a credit card. It also converts your currency automatically - see the price in your currency by clicking here.